ValuJet Airlines was a low-cost carrier that operated in the Eastern United States during the 1990s. After a series of safety problems and the fatal crash of ValuJet Flight 592, the company executed a reverse merger with the much smaller regional airline AirWays Corp., now known as AirTran Holdings; thus, ValuJet now operates as AirTran Airways. The name was a major problem. I specifically remember a comedian, who was probably speaking for many people, saying, "ValuJet? Who wants to fly ValuJet? I want to fly Safety-Jet!" The name just compounded their problems. This morning I saw this van on my way into the office. 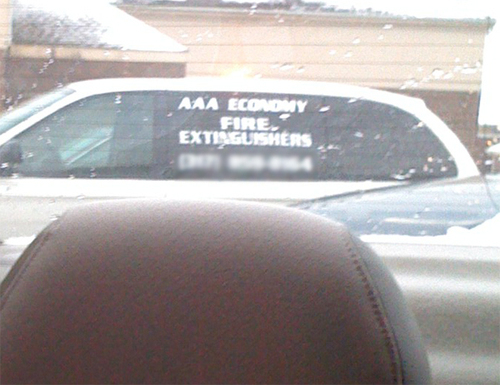 "AAA Economy Fire Extinguishers." Come on. If I'm ever faced with the need for a fire extinguisher, I want the most dependable fire extinguisher. The most expensive, dependable, fully charged fire extinguisher I can find. Now, I may not be their audience, so, perhaps the name is perfect. If I'm a property manager and I'm required by law to equip my properties with fire extinguishers to meet code and "good" is good enough...this name suggests that these are my guys. Kirsten Anders from Traders Point has a question for you guys. If you could take a few minutes to with a quick response, we sure would appreciate it. They currently use the title "Minister of Assimilation" for the person who works with new members, familiarizing them with TPCC and getting them more involved into the church. They are looking for a new title to give this person. What do you guys call this person or what are some suggestions you have? I'm excited to see what they come up with. Many churches (including my own) have used this title...and I think it's horrible. Who wants to be "assimilated?" Most people want to be loved! Oh, and it's even worse if you say it with a bad Arnold Schwarzenegger accent: "Don't move. Vee vant to assimyulate you." Yikes! So...got any suggestions? Comment here and we'll make sure Kirsten follows along. Bekky - first, sorry about your sad and personal connection to ValuJet. Second...I'm with you...Creepy. Glad they are heading toward a new name. First, I lost a friend in that ValuJet crash, and the name ValuJet now gives me shivers. Ever since then I have steared clear of any business with a name similar to your AAA Economy Fire Extinguishers...it's almost like a superstition...if I were superstitious. Secondly, though I am NOT a Trekkie, when I hear the word assimilation it makes me think of the Borg from Star Trek. CREEPY! The title, Minister of Assimilation, sends off cult-like vibes to me. I'm going to have to give some thought to what might be a better title.